Stephen Baxter is confident his title-winning Crusaders side will put an opening defeat by Portadown behind them as they face Glentoran on Wednesday. The Crues lost 2-1 at home to the Ports and manager Baxter knows the Oval trip will present another stiff challenge. "There are always topsy-turvy results in the first couple of months of the season," said the Seaview boss. "Teams are fresh and hungry. Last year I think we won just one of our first four games in the Premiership." Baxter admitted the loss of Declan Caddell was a big blow. The midfielder sustained a broken foot bone in the Charity Shield defeat by Glentoran on 1 August. Skipper Colin Coates missed the Portadown match because of illness while front man Michael Carvill was sidelined by an ankle problem. 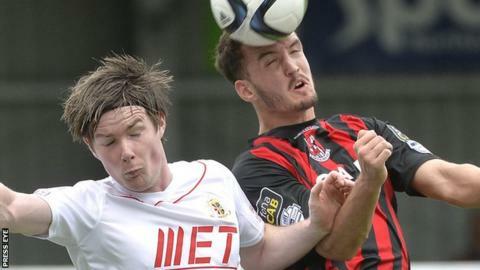 Meanwhile, last season's runners-up Linfield will look to follow their 3-0 win over Ballymena United by picking up another three points when they visit newly-promoted Carrick Rangers. "I was really pleased with Saturday's performance, but Carrick will be a very hard game," said Blues manager Warren Feeney. "They have a bit of momentum and this is their first home game back in the Premiership. "We are going there as firm favourites but I have told the lads they need to apply themselves right." Portadown striker Darren Murray misses his side's home game against Warrenpoint Town as a result of his red card at Seaview. Former Linfield pair Michael Gault and Mark McAllister must also sit out the Shamrock Park match as they continue to serve suspensions. Glenavon player-manager Gary Hamilton has demanded an improvement from his team for Wednesday fixture away to Ballymena United. The Lurgan men were beaten at home to Cliftonville at the weekend and Hamilton was far from impressed. "The 1-0 scoreline papers over the cracks. We fell short of where we expect the players to be. "We did not win enough tackles. To win against the top teams like Cliftonville, you have to work as hard as they do, if not harder."